Among the events lined up so far for The Suffragents (Facebook lists them most handily or look below) is one now being scheduled for October 22, 2017, at the Woodlawn Conservancy . This invitation was especially pleasing to me—much like the one from the New York City Corner Book Store was for September 11, and for similarly sentimental reasons. 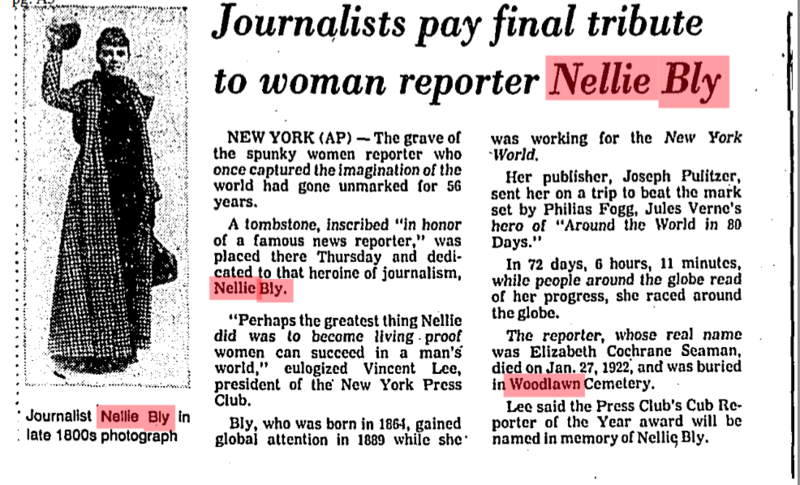 Nellie Bly, the subject of my first book, is buried at Woodlawn in a grave that was left chillingly unmarked for about half a century. 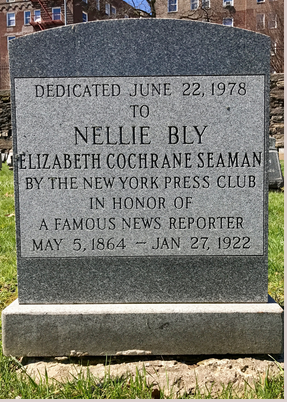 Chapeau to The New York Press Club for placing a headstone for her in 1978 and for establishing an eponymous cub reporter award in her memory. I’d love to know how all that came about. Bly was only 58 when she died in 1922. At the time, she was a columnist at the New York Evening Journal for her longtime friend from New York World days, Arthur Brisbane, a job he created for her on her return from Vienna after World War I. Those columns were hard to find. The only extant copies of her columns I could locate were at the University of Texas at Austin. 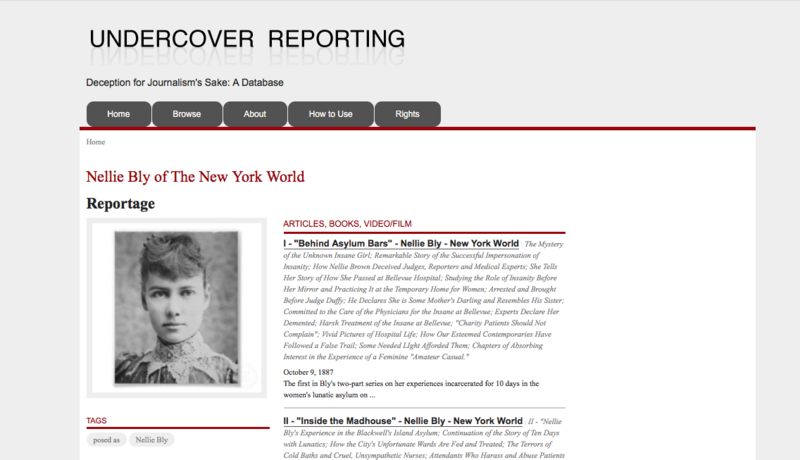 You can read all of Nellie Bly’s greatest hits as an undercover reporter here, on the undercovererporting.org database I created with NYU Libraries. It’s a digital archive that anyone can access, emanating from my research for Undercover Reporting: The Truth About Deception, which was published in 2012. I like engaging with creating databases from hard-to-retrieve resources. 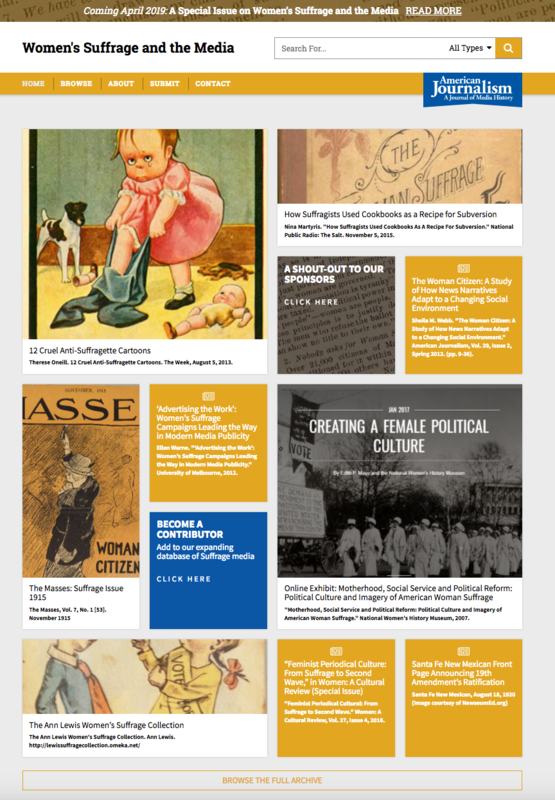 The newest is suffrageandthemedia.org, created far beyond the scope of The Suffragents with a group of amazing journalism and communications history scholars. It’s our contribution to this period of celebration of 100 years of women in the United States having the vote.